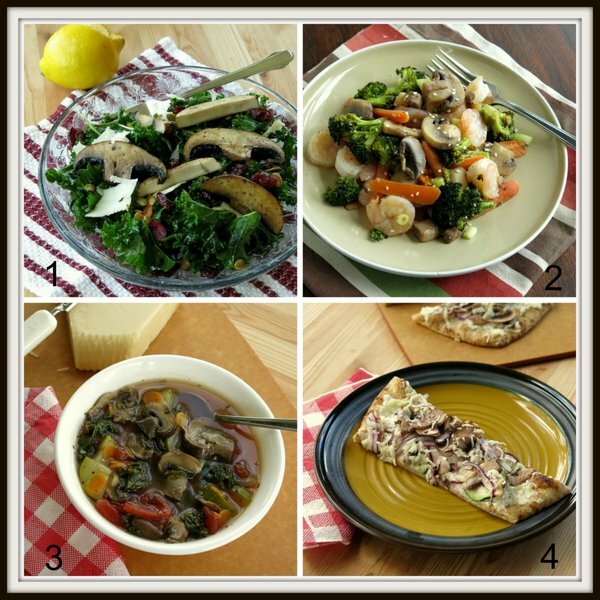 This Shaved Vegetable Pizza Recipe and post were created as part of the #MushroomMakeover 30 Day Weight Loss Challenge in which I am a financially compensated blogger ambassador for The Mushroom Council. The opinions are my own and based on my own experience. Mushroom mania continues. But that’s nothing new at our house. Every Friday night (almost) is pizza night. My favorite topping? You guessed it…mushrooms, paired up with a few other faves like red onion and zucchini. 1-We started off the week with roasted portabello mushrooms atop a lemony kale salad. Let’s just say I’m a kale salad lover after rubbing the kale leaves with lemon to marinate and soften them. The greens paired perfectly with the beefy portabello mushrooms. A little shaved asiago cheese rounded out this delicious dinner salad…it was that filling. 2-This is a super-charged version of Roasted Broccoli with Sesame Dressing. Along with broccoli, I roasted carrots, mushrooms and shrimp. Everything is tossed with a rice vinegar/sesame oil sauce and topped off with sesame seeds and green onion. Festive! 3-And, then there’s the soup. I love Hearty Vegetable Soup. Whatever vegetables are on hand go in the pot (kale was the new addition this time.) When I make soup, I make a lot and package up 1 cup portions to freeze. Soups on…after about 3 minutes in the microwave…any time! See that block of Parmesan cheese peeking out of the corner? Oh yes I did…I grated it all over the top! 4-Shaved Vegetable Pizza! 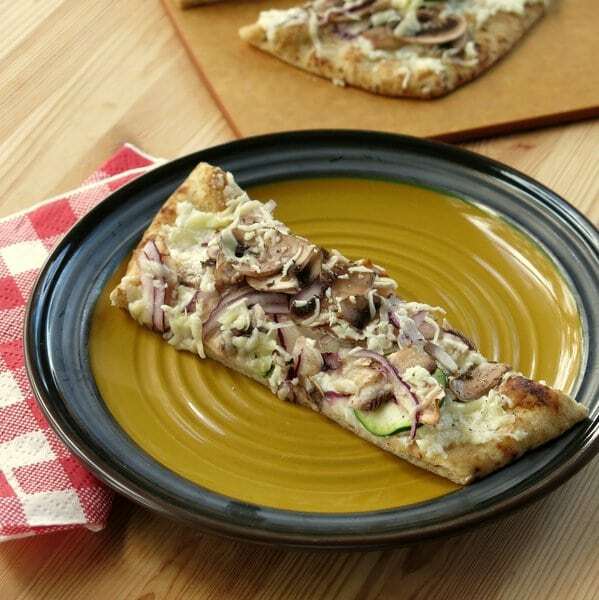 It’s on whole wheat flat bread and it’s loaded with very thinly sliced mushrooms, onions and zucchini. See the full recipe below. Finally, as you can probably imagine, I have a lot of mushroom and guacamole on hand these days, which led to this creation – Guacamole Stuffed Mushrooms. They are awesome…a combo of two favorites into a guiltless and delicious snack. 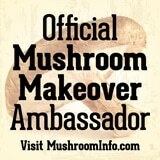 For more mushroom tips and inspirations, check out The Mushroom Council AD website or The Mushroom Channel AD on Facebook. So…how about that recipe for Shaved Vegetable Pizza? 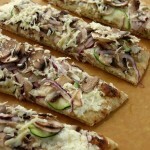 Mushrooms, red onions and zucchini are very thinly sliced and roast right on the flat bread as the three cheeses melt! Mix olive oil and garlic in a small bowl and brush over flat bread. Mix cheeses together in a bowl and then spread evenly over flat bread. Very thinly slice mushrooms, onion and zucchini, preferably using a mandoline. 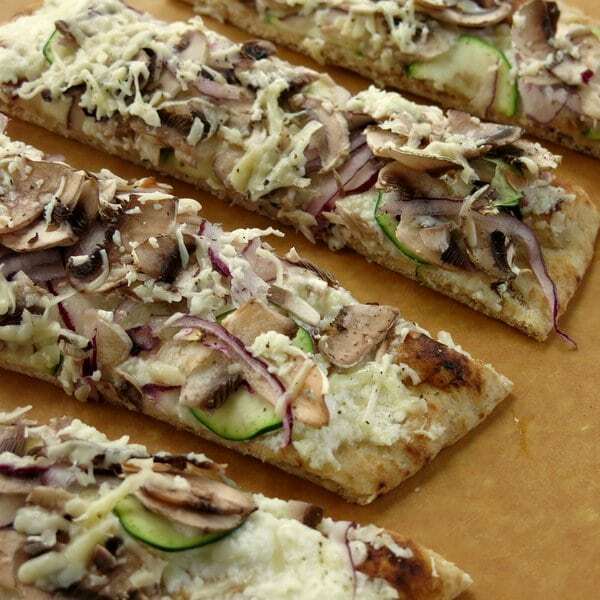 Arrange vegetables over flat bread and then sprinkle additional mozzarella and Parmesan cheeses on top, if desired. Bake for about 5-6 minutes on a pizza pan or directly on rack for a crisper crust. She should be melted and vegetables softened. I made a mushroom pizza last night! yours looks fantastic… and I LOVE the idea of guacamole mushrooms – Mmm! have a great weekend! Thanks Kristina! I have always loved mushrooms on pizza…it never gets old. Hope you have a wonderful weekend too! 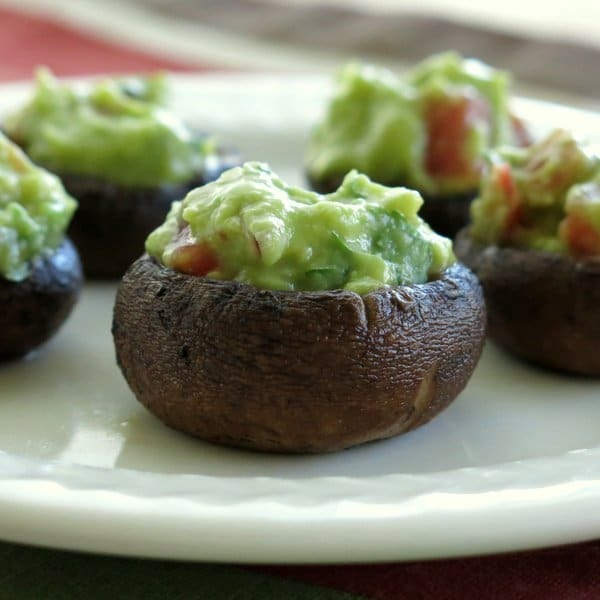 In love with those avocado guacamole stuffed mushrooms you have great ideas! Thanks Adriana! It’s so fun reading everyone’s creations…and coming up with ideas! Marjory, I love mushrooms – almost every Friday we do pizza – mushroom on it all then we get halfies to do what we want! This pizza looks really great!! Thanks Deb! Sounds like we are on the same page about mushrooms and pizza!